What makes New Jersey so special? In addition to culture, wonderful suburban towns, a high standard of living, strong public schools, a mild climate, mountains and beaches, we must add one more: innovation. In addition to the creations of Bell Labs and Thomas Edison, New Jersey has innovators and inventors galore. 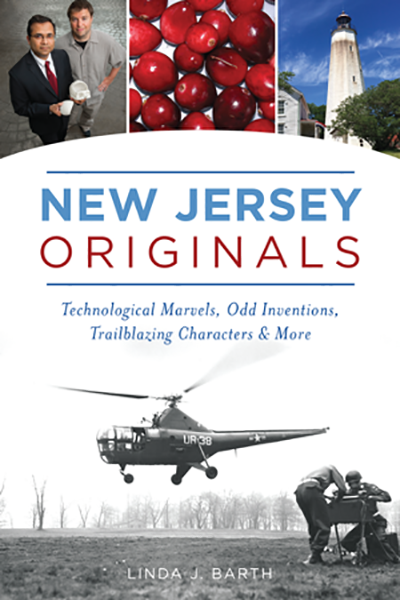 In the first volume, A History of Inventing in New Jersey: From Thomas Edison to the Ice Cream Cone, we detailed our state’s many inventions in science, communications, food, medicine, sports, and transportation. In this book, you can learn about more of the inventions of Bell Labs and Edison, in addition to other valuable, brilliant, and quirky creations. The work of our soldiers at Fort Monmouth and Camp Evans—including radar and night vision goggles—helped the United States win World War II. Cook College at Rutgers has produced important, often disease-resistant, vegetables and flowers. Among the edible inventions are pork roll, M&M’s, and the famous Campbell’s green bean casserole. Quirky firsts include Lucy the Elephant and the Francis life car. And just for fun, I’ve added some famous and not-so-famous New Jerseyans. Linda Barth has been a fan of New Jersey for a long time. As a fourth-grade teacher, she tried to focus students’ attention on the positive aspects of our state: its diverse geography, history, agriculture, industry, and famous firsts and inventions. A lifelong resident of the Garden State, Linda has written two books on the D&R Canal for Arcadia Publishing and two children’s picture books: Bridgetender’s Boyand Hidden New Jersey. A History of Inventing in New Jersey: From Thomas Edison to the Ice Cream Cone, published by the History Press, was released in 2013. With her husband she has published The Millstone Valley Through Timeand Somerville Through Time. She has also contributed to the Encyclopedia of New Jersey. She will have copies for purchase and she will sign them too. Thanks to the Mount Tabor Library for co-hosting with us.